Headlines of national economic strength belie the reality that millions in the US are living in financial precarity. Even worse, families that are still recovering from the last recession will be the first to suffer from the next recession, which many analysts warn is around the corner. Because people of color, particularly Black, Latino, Native American, Native Hawaiian and Pacific Islander people, live in a different economic reality than what oft-cited national data shows, we need to be honest about the impacts race and ethnicity have on economic outcomes. The exploration and acknowledgement of racial and ethnic disparities and their origins make our data clearer and our local, state and federal policies stronger. Solutions to our collective economic peril will remain elusive if we do not center the impact of race and racism. 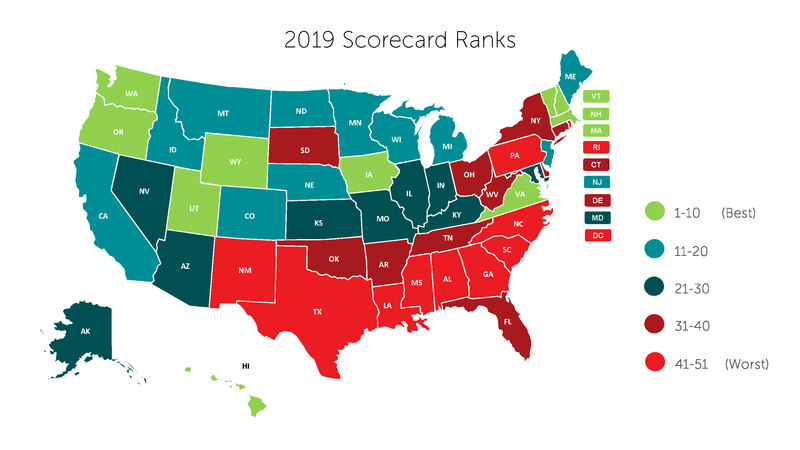 Welcome to the 2019 Prosperity Now Scorecard—a data resource that illustrates the financial health of families in all 50 states and the District of Columbia (DC). Our previous Scorecards have explored how economic prosperity is far from reach for millions of people and that the decisions of our policymakers, not the decisions of low-income people, are largely to blame. Those themes are still true, and this year’s Scorecard dives deeper into the outcomes of people of color in states across the country. 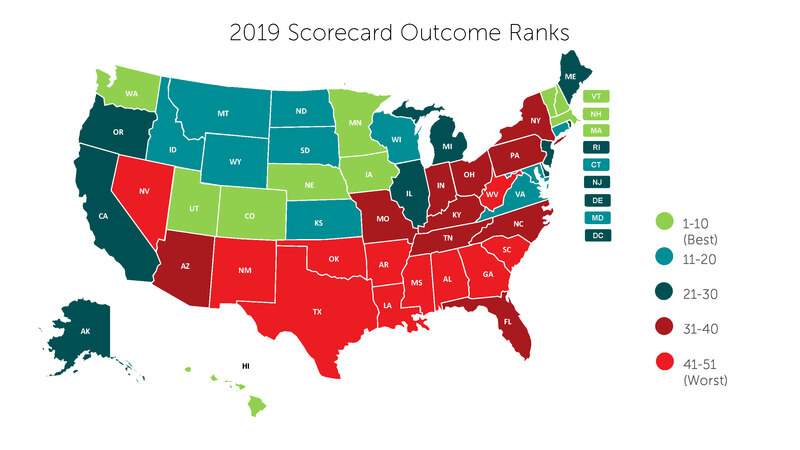 This year, the Scorecard includes more data by race and takes a new approach to scoring states on their relative outcomes. 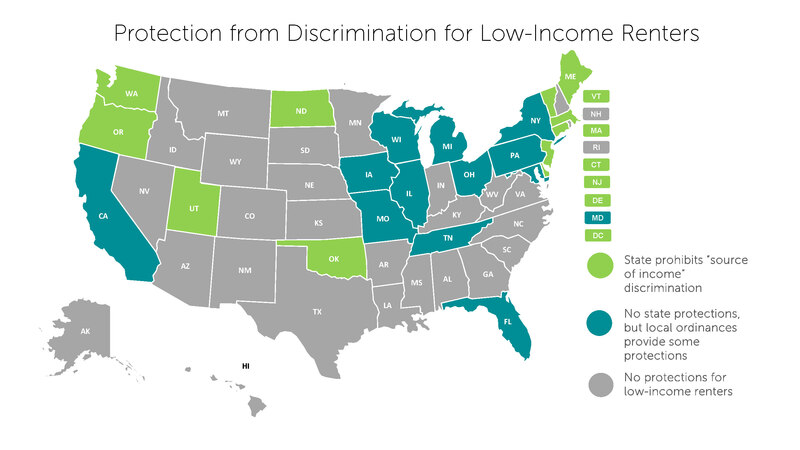 This brief shares insights on racial and ethnic disparities in states, how states compare when accounting for these disparities, general trends across states and policy implications. The following is a visual essay explaining our latest ranking methods, our top four findings from the 2019 Scorecard state-level data and the progress states have or have not made towards implementing policies that start chipping away at these issues. Why Account for Racial Disparity? As Prosperity Now has increasingly focused on the racial wealth divide over the past several years, we are more consistently highlighting the role that racial economic inequality has on a household’s ability to achieve prosperity. Changes to the Scorecard state rankings demonstrate more clearly than ever the extent to which racial inequities in family and resident outcomes drag down a state’s overall performance. It is no coincidence that people of color perform worse than White people in every conceivable metric: median net worth and households with zero net worth; unbanked and underbanked households; unemployment and business ownership; homeownership and cost-burdened households; uninsured and forgoing doctor visits due to cost; high school graduation; college degree attainment; and youth disconnection. Even states with sizable and relatively well-performing Black, Latino and Native populations fall behind many of their less racially diverse peers. Abetted by the federal government, several states have actively subverted the well-being of their residents of color. A handful of states—including Kentucky, Michigan, Ohio and Virginia—have pursued work requirements for public benefit programs that target population centers with higher populations of low-income people of color, while exempting areas with a greater proportion of low-income White households from these requirements. (1) Most notably, Michigan drew up legislation establishing work requirements for Medicaid eligibility that would exempt rural, largely White counties, while leaving the state’s high unemployment, largely black cities subject to them. (2) This caveat would result in White people comprising 85% of those exempted from work requirements for Medicaid, and Black people comprising 1.2%; the groups constitute 57% and 23% of the state’s total Medicaid population, respectively. These legislative actions, punitive in nature, are indicative of the racial animus that has governed the social, political and economic structures of the United States since its beginnings as a colony. The fruit of these policies, and their forebears, are manifold. Nationally, and in more than a quarter of states, Native American, Black and Latino households are all more than twice as likely to live in income poverty as White households. Of the 20 states with available data, there are 16 in which over a quarter of all Black households have zero or negative net worth, and 18 in which more than half of Black households are liquid asset poor. In 11 such states, including Michigan, households of color have zero or negative net worth at more than twice the rate of White households. If automobiles are removed from the calculation, 40% of Black households nationally have zero net worth, a rate double that of their White peers. 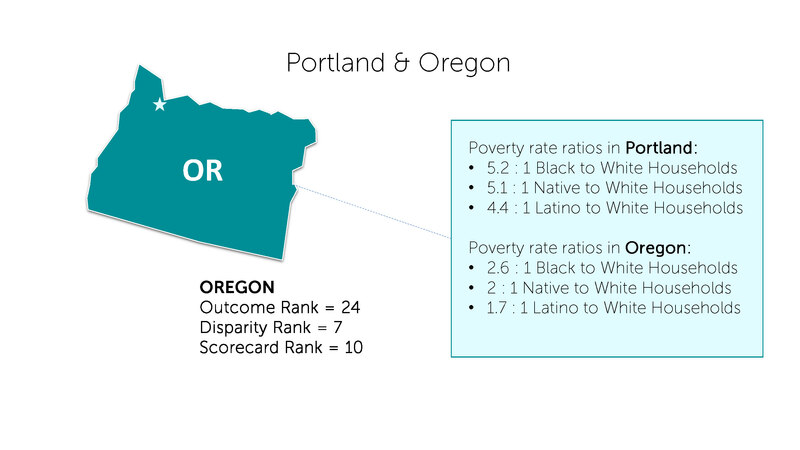 Given the harsh economic realities facing people of color and the availability of data, we decided to add more data by race and alter our method for comparing states to account for some of this disparity in our rankings. How Is the Scorecard Rank Different This Year? Click here to take a closer look at the Top 5 and Bottom 5 States. 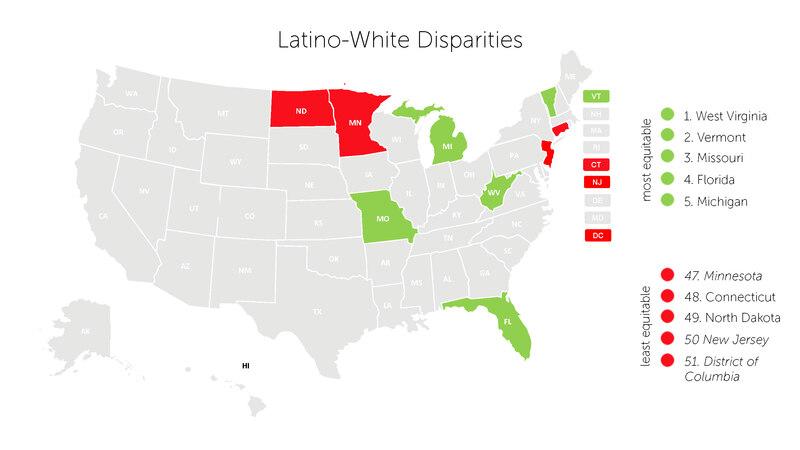 Finding 1: Some states perform worse this year because they are failing people of color. 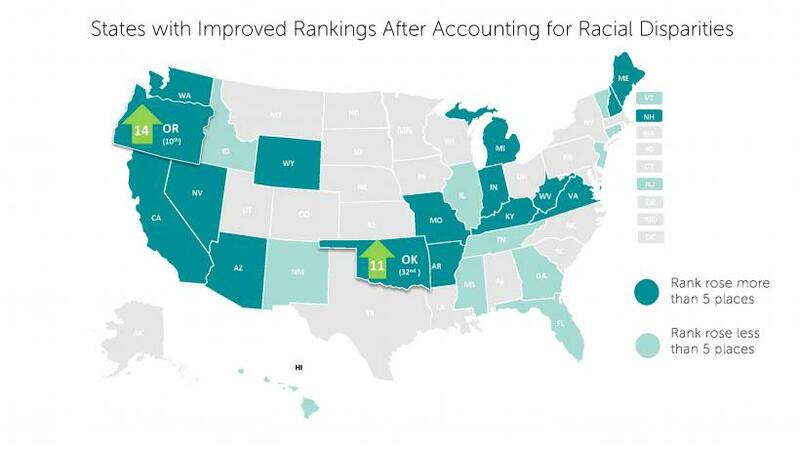 Our new ranking methodology allows us to disentangle a state’s overall outcome from the inequities in economic outcomes for its different racial and ethnic populations. Roughly half of the states (23) as well as DC had a final Scorecard rank lower than their Outcome rank after accounting for the size of the racial disparities in the state, and 14 of those states and DC (shown above in dark blue) saw a rank reduction of five spots or more. For example, Minnesota and Maryland’s rankings have lowered to reflect the large racial disparities in outcome measures within these states. 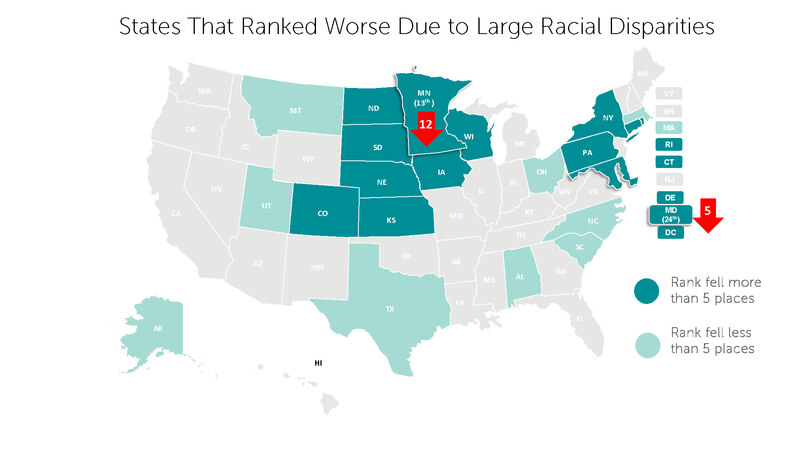 Minnesota has the best Outcome rank of all 50 states and DC, but its massive racial disparities earn Minnesota a Racial Disparity Rank of 44, reducing the state’s overall rank 12 spots to 13. Maryland has an Outcome rank of 19, but its Racial Disparity rank of 36 pulls its overall Scorecard rank down five spots to 24. Minnesota’s largest gaps in outcomes for White residents and residents of color are its underbanked rate, homeownership rate and income poverty rate. 76.8% of White residents are homeowners whereas only 24% of Black residents and 45.9% of Latino residents own homes. While only 9.6% of White households in Minnesota are underbanked (have a checking and/or savings account but still use alternative financial products) this number jumps to a staggering 32.7% for households of color, the largest gap in the country. Adding to the financial vulnerability of Minnesota’s households of color, more than a quarter of Black households are income poor (28.9%) versus less than a tenth of their White counterparts (7.6%). Not only are Minnesota’s residents of color facing significant financial challenges, these disparities pervade age groups. Less than five percent of young White adults are classified as “disconnected” (i.e., people aged 16-24 who are neither in school nor employed) but this number almost doubles, jumping to almost 10% of young Black adults (9.8%), 9.1% of young Asian adults and 8.8% of young Latino adults. This has huge implications on their ability to achieve prosperity later in life and, taken with hardships they face in other areas, significantly hinders not only their ability to overcome financial threats but leaves these residents unprotected against economic challenges and downturns. Maryland, on the other hand, ranks 36th in racial disparities. While Maryland has narrower gaps in achievement between White residents and residents of color than Minnesota, it still has large disparities in its liquid asset poverty rate, uninsured rate and percentage of residents who fell behind on paying their bills in the past 12 months. In Maryland, 44.9% of Black households do not have adequate cash savings to support themselves at the poverty level for three months if they faced a financial emergency. In contrast, only 17.9% of White households do not have enough cash savings. Additionally, only 7.8% of White households fell behind on their bills in 2017, whereas this number more than doubled for households of color (18.5%). This disparity is intensified by the racial inequities observed in other important indicators such as the uninsured rates of Marylanders. While only 6.7% of Black residents in Maryland are uninsured—not far from the uninsured rate for White residents—this figure more than triples for Latino residents, with 22.9% being uninsured. Though Maryland’s Outcome and Racial Disparity ranks are close to average, there are clear disparities in the prosperity of White residents and residents of color. This leaves people of color, specifically Black and Latino populations, struggling and more financially vulnerable than White residents in the state. States such as Minnesota and Maryland perform well on outcome measures because of the success of their majority White populations. When compared to outcomes for just White residents across the nation, Maryland has the second best set of outcomes while Minnesota has the fourth best. Compared to other residents of color across the country, Minnesota and Maryland’s residents of color do well: Maryland is seventh in outcomes for residents of color while Minnesota is eighth. Given this, one would expect Maryland and Minnesota to have better Racial Disparity ranks. However, what Minnesota and Maryland show us is that success for White residents and residents of color across the nation is not the same. Additionally, just because a state ranks highly for residents of color, this does not mean all populations of color are succeeding equally. For example, Minnesota ranks only 24th in outcomes for Black residents and 40th in outcomes for Latino residents. Though Maryland does rank 1st in outcomes for Black residents, it is failing its Latino residents, who rank 41st when compared to other Latino residents across the country. Finding 2: In some cases, states perform better because their racial disparity is relatively low compared to other states. In 26 states, adding the disparity rank improved their resulting Scorecard rank. Sixteen of these states (in dark blue) saw an increase of five or more places. In some cases, the disparities are low because these are states where people of color are performing better than in other states. In other cases, White people are not performing well in comparison to other states. Regardless of either situation, the existence of racial economic inequality is problematic for a state’s economic prosperity and the resilience of its people of color. The contours of disparity also depend on a state’s demographic composition and geographic (urban-rural) distribution Narrower disparities by race at the state level are masking more extreme inequity at the local level. 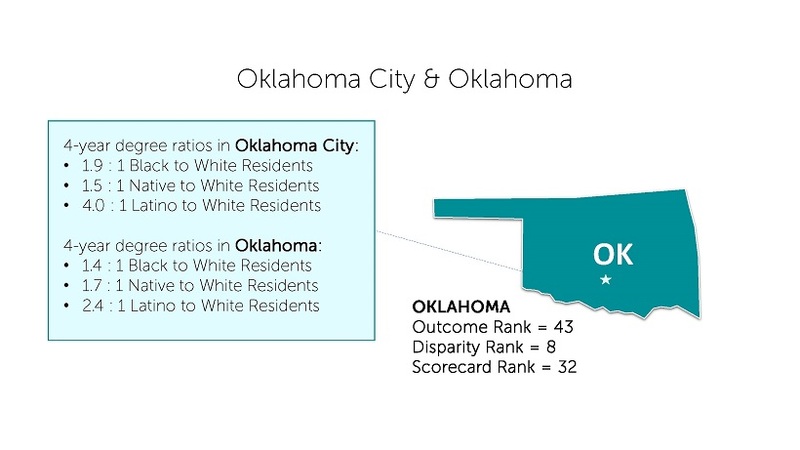 The same is true when you compare disparities in Oklahoma compared to Oklahoma City. Rates of college attainment in Oklahoma City are nearly twice as high for White residents than for people of color. This rift doubles to four times as high when White college attainment rates are compared to that of their Latino counterparts. (5) Statewide, these gaps fall to 1.5 times higher for White residents compared to people of color (and 2.4 times higher compared to Latino residents). The gap narrows in Oklahoma overall primarily because, state-wide, White adults have lower rates of four-year college degrees than in Oklahoma City (28.1% vs. 35.5%, respectively). Meanwhile, the rate of four-year college degree attainment for people of color remains stagnant at 18% in both locations, making the racial disparities in Oklahoma City that much larger when compared to the state of Oklahoma. Cities represent the promise of opportunity, but these large disparities in major cities like Oklahoma City and Portland demonstrate that those promises are broken for the people of color that call them home. Finding 3: No matter the state, people of color—particularly Latino, Black, Native American and people of Native Hawaiian and Pacific Islander descent—are not experiencing the touted economic upswing. No matter where in the country we look, states are failing people of color in many dimensions. Despite continued messaging alleging the economic success of people of color under the current presidential administration, household and community outcomes tell a story of stagnant earnings, rising debt and dwindling financial security for any household not buttressed by intergenerational wealth. Through its administrative and public policy decisions, the federal government has signaled unambiguous hostility toward working families and people of color over the past two years, leveraging the strength, stability and futures of those people and families to finance short-sighted, short-term bonuses for the nation’s wealthy White households. In this hostile policy environment, the task of protecting the interests of the majority of the nation’s households has fallen upon state governments and administrators. Yet, many have failed to live up to the task: Scorecard outcomes suggest that states are having little success ensuring that economic security is the inheritance of each and every resident. Racial disparities in outcomes exist in every state in the country, from Hawaii to Maine, Florida to Alaska. As previously noted, immense disparities in household net worth—and, most troubling, households with zero net worth—ensure that Black, Native American, Native Hawaiian or Pacific Islander, and Latino households are at a perpetual and largely insurmountable disadvantage. (6) These disparities in household net worth are driven, in part, by inequities in the housing market, which are, in turn, exacerbated by income and earnings inequality. Rates of homeownership among White households are higher than homeownership rates among all other households of color, of every racial or ethnic group, in every state, with the lone exception of Asian-identifying households in Hawaii. Because the median household income of Black households is lower than that of White households in every state, homeownership is less affordable for Black households than White households. The same holds true for Latino households in every state but West Virginia (where Latino people constitute 1.3% of the total population, the lowest Latino population share of any state), and for Native American households in every state but Tennessee (0.2% of the total state population). The nature of these state-level disparities becomes clearer when reviewing the states with the greatest and least disparities for each individual racial and ethnic group. 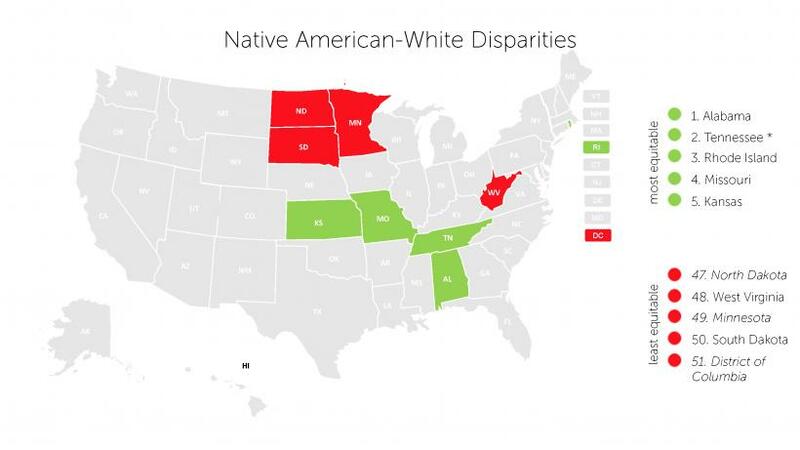 In calculating the Racial Disparity ranks for the states, we were also able to identify the states with the largest and smallest disparities between their White residents and their Black, Native American and Latino residents. When comparing the cumulative disparities by different racial and ethnic groups for which there is data in the Scorecard, a pattern quickly becomes clear. 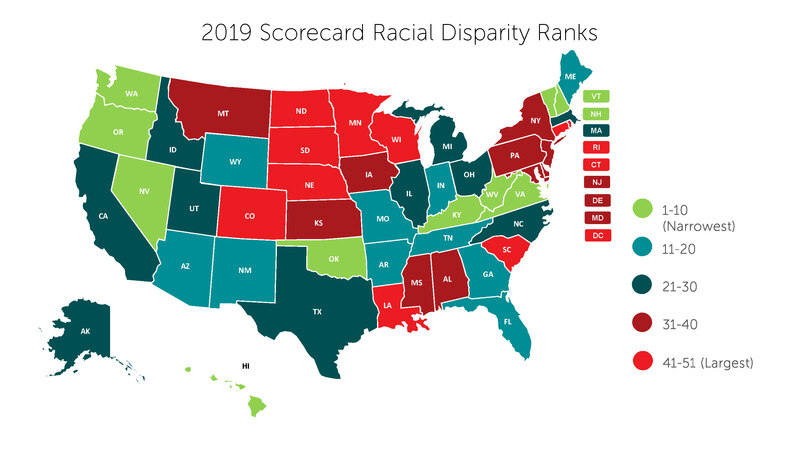 There is no overlap whatsoever among the top five states—that is, the five states with the lowest disparities in outcomes—for each individual racial and ethnic group. Rather, the most consistent pattern among the states with the lowest disparities by race and ethnicity is that these states are, consistently, the states that perform worst with respect to outcomes for White households. The states with the lowest Black-White disparities are the most indicative of this phenomenon, with three of the five appearing in the bottom-ten with respect to outcomes for White households (Kentucky, West Virginia and Arkansas). 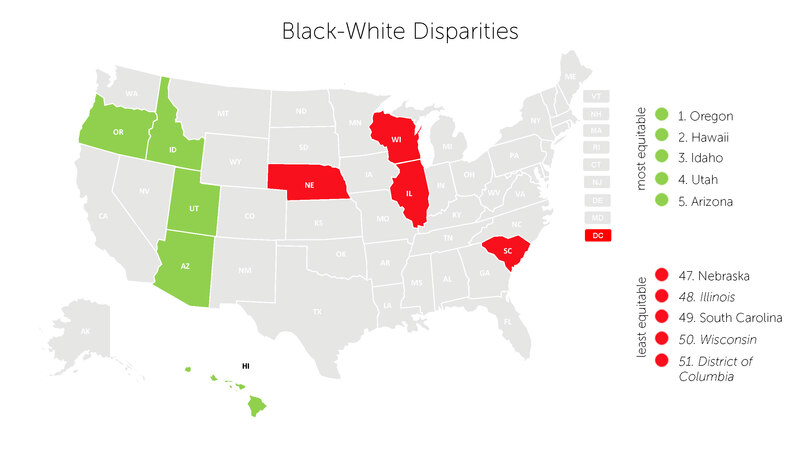 There is, however, quite a bit of overlap among states with the greatest disparities by race. South Dakota, Nebraska and Minnesota each show up in the bottom five of at least two of the three aforementioned racial and ethnic groups’ disparity rankings; the urban, affluent and increasingly stratified District of Columbia lands at the bottom of all three. With little exception, the states that populate the ranks of the least equitable are those with a largely-homogeneous and fairly affluent White population. The Great Plains, upper Midwest and Northeast are well represented: Minnesota and the Dakotas rank worst with respect to Native American-White outcome disparity; Minnesota, Nebraska and New Jersey rank worst with respect to Latino-White disparity; and Wisconsin, Pennsylvania and Nebraska rank worst with respect to Black-White disparity. No matter the state, people of color—especially those of Native American or indigenous, Hispanic or Latino, Native Hawaiian or Pacific Islander and Black or African American descent—have yet to fully recover from the losses of the 2008 recession. In many cases, the nation’s non-white communities are losing hard-earned, long-fought gains. In fact, these inequities and economic oppressions hinder our economic growth and sustainability. Closing the wealth and opportunity gaps in the United States will require investing in every person, family and community residing within its borders—in effect, turning our backs on 400 years of discriminatory muscle memory, and living up to our nation’s professed beliefs of equality, liberty, justice and opportunity for all who live here. (7) Fortunately, states can take action to reverse this. Conclusion: States should enact policies to strengthen the economic resilience of people of color. Policies that promote economic success and a more prosperous future for all families must begin with a clear recognition that the racial disparities identified by Scorecard data are a fundamental wrong that must be righted. But our policy response must extend beyond mere acknowledgements of the structural and institutional barriers we hope to erode. Good policies—policies that can realistically impact racial economic inequality—proactively serve first and foremost the individuals and families whose lives they intend to improve while also building economic strength and resiliency in the broader communities in which we live together. In identifying policies that rise to this challenge, it is our intention to promote those that espouse targeted universalism, a concept developed by john a. powell that emphasizes focusing on universal goals with targeted approaches to address the specific needs of individuals. (8) This framework ungirds the principals we believe are at the heart of good policies. As we strive to achieve more financially resilient communities, we must turn to policies that address our underlying vulnerabilities, particularly the gaps we see between households of color and White households in every state. The Prosperity Now Scorecard assesses states on 28 policies that we believe can move the needle towards greater racial wealth equity and lay the foundations of our broader goal of financial security, wealth and prosperity for all families. Because the state of financial security varies between states, policy agendas and designs will need to be tailored according to each state’s unique situation. To develop a deeper understanding of both the specific policies states can enact beyond what we describe in the Scorecard and considerations for successful implementation, we encourage policymakers and advocates alike to explore Prosperity Now’s recent publications: A State Policy Blueprint for a More Inclusive Path to Prosperity and Racial Equity Policy Design and Advocacy: A Primer. The policies within the Scorecard are not silver bullets that can instantly solve deep racial wealth disparities. They are a start to a process that can lead states to a more prosperous future for all individuals, families and communities. What follows are several key policies identified in the Scorecard that, if implemented and funded, should bring these futures closer to reality. The federal Earned Income Tax Credit (EITC) remains one of our nation’s largest anti-poverty tools, lifting millions of American households out of poverty each year. The states can enhance the support this credit provides by enacting an additional state-level tax credit typically structured as a percentage of the federal credit received by the taxpayer. To provide the greatest effectiveness, it’s essential that these state credits are structured in a way that maximizes the direct benefit of state EITCs to working families. At the very least, the Scorecard recommends that states structure their EITCs to be valued at a minimum of 15% of the federal EITC and that the credit is refundable, i.e. allowing any amount of the credit that exceeds an individual’s tax liability to be returned to them in the form of a refund. 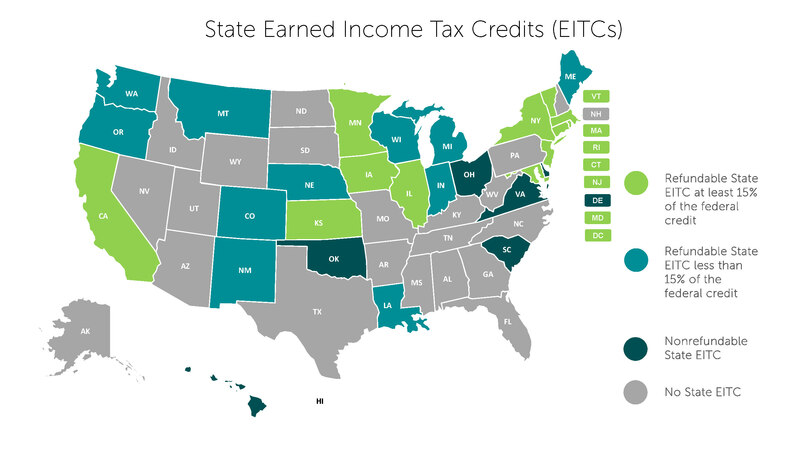 As of the end of 2018, 29 states and DC have enacted state EITCs that incorporate varying percentages of the federal credit and refundability, and 12 states and DC have enacted refundable state EITCs that are worth at least 15% of the federal EITC. Public benefits programs, including Temporary Assistance for Needy Families (TANF), the Supplemental Nutrition Assistance Program (SNAP) and the Low-Income Home Energy Assistance Program (LIHEAP), are a cornerstone to ensuring American families can meet their basic needs in the event of a financial crisis. While these are federal programs, states have substantial discretion to determine eligibility requirements and the distribution of benefits. Some states have chosen to use this discretion to impose savings penalties, also known as asset limits or resource tests, to restrict eligibility based on an applicant or recipient household’s assets. This includes disqualifying those with certain levels of liquid savings, a home, cars or other investments. These restrictions have been consistently shown to discourage savings among low-income households. While savings penalties are overly punitive to all applicants and recipients of public assistance, they are even more so for communities of color. A study of TANF programs showed states with larger African American populations also have more restrictive eligibility criteria and less generous benefits relative to states with fewer African Americans,(11) an imbalance that could easily exacerbate the racial wealth divide even among low-income families, leaving some families more vulnerable to financial shocks than others. The clearest option is for states to remove these barriers and allow all families to simultaneously access our critical safety net and build savings as both a safeguard against shocks and a foundation for economic mobility. While most states have already chosen not to impose asset limits on LIHEAP (42 states and D.C.) and SNAP (34 states and D.C.), only eight states—Alabama, Colorado, Hawaii, Illinois, Louisiana, Maryland, Ohio and Virginia—have eliminated savings penalties for TANF. Housing Choice Vouchers are designed to help low-income families afford rental housing in the private market while simultaneously discouraging concentrations of poverty in specific communities and racial segregation in housing. Unfortunately, in many states, potential tenants may be turned away solely based on their need to use a voucher to cover all or a portion of their monthly rent. This practice is often referred to as source of income (SOI) discrimination, deepening the divisions in housing opportunity and maintaining the status quo of housing segregation. As of the end of 2018, 11 states and the District of Columbia have enacted laws to protect Housing Choice Voucher recipients from SOI discrimination. In 12 other states where statewide SOI anti-discrimination laws have yet to be enacted, local jurisdictions including municipal and county governments have stepped up to enact their own local-level SOI laws. Homeownership continues to be the largest source of wealth for families in America. Yet, the Scorecard reveals that deep disparities exist between the homeownership rates of White households and households of color in nearly every single state, with White homeownership rates substantially higher in all but one state. These gaps in homeownership and wealth are, in many cases, caused by a history of structurally and institutionally racist policies. They have had compounding and lasting impacts on communities of color through the ability to transfer homes and other assets to future generations through inheritance, widening our already gaping racial wealth divide. States can begin to remedy this situation and promote greater racial wealth equity by investing in policies that support increased access to homeownership opportunities through first-time homebuyer supports, including downpayment assistance, homeownership counseling and direct lending. These policies can put homeownership in reach for potential homebuyers who might otherwise lack enough savings for initial downpayments or have insufficient access to affordable credit options. 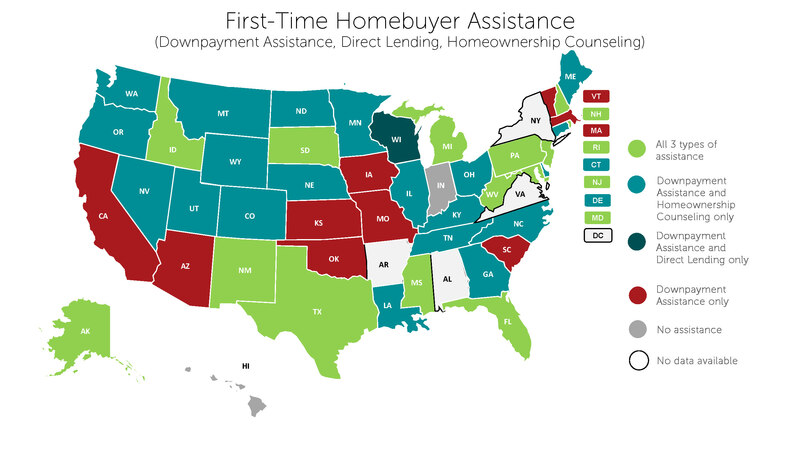 While nearly every state (44 states) provides some form of downpayment assistance, 34 states also funded homeownership counseling programs and 15 states offered direct lending options to lower-income, first-time homebuyers. 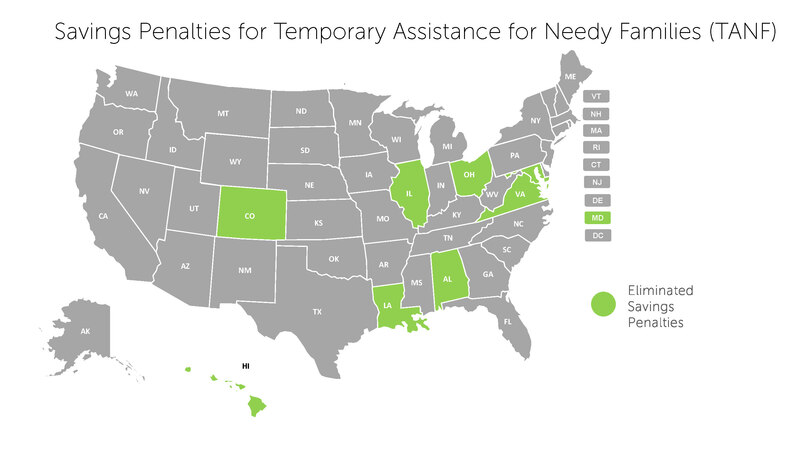 Thirteen states reported providing all three forms of assistance in 2018. The authors thank Prosperity Now staff who contributed to this brief—Roberto Arjona, James Durrah, Sandiel Grant, Jeremie Greer, Kristin Lawton, Shehryar Nabi, and Kasey Wiedrich. Thank you to Algernon Austin, Economist with Demos, for his review of and suggestions for this report and the Scorecard ranking methodology. The 2019 Prosperity Now Scorecard was made possible by the generous support of the Robert Wood Johnson Foundation and the Ford Foundation. Covert, Bryce. “The Not-So-Subtle Racism of Trump Era ‘Welfare Reform’,” The New York Times. March 23, 2018. https://www.nytimes.com/2018/05/23/opinion/trump-welfare-reform-racism.html. Nicholas Bagley & Eli Savit. “Michigan’s Discriminatory Work Requirements,” The New York Times. May 8, 2018. https://www.nytimes.com/2018/05/08/opinion/michigan-medicaid-work-requirement.html. See the technical brief on the new Scorecard ranking methodology for more information on how these separate ranks are calculated at https://prosperitynow.org/sites/default/files/resources/2019_Scorecard_Technical_Documentation.pdf. In the Scorecard, we report data for an aggregate Asian population, which includes people with ancestry from a large variety of countries: China, India, the Philippines, Vietnam, Korea, and Pakistan to name some of the largest countries of ancestry. Using this definition of the Asian population, many Scorecard outcomes for Asian households nationally and in many states are close to or exceed outcomes for White households. While we use the aggregate statistic in the Scorecard because there is insufficient data to break out the data further in most states, we recognize that this category is too broad to be illustrative of the economic diversity within the Asian population in the United States. “Equity Is the Superior Growth Model for an All-In Nation,” Policy Link, 2013, http://www.policylink.org/sites/default/files/Equity-Primer.pdf. “Targeted Universalism,” Haas Institute for a Fair and Inclusive Society, https://haasinstitute.berkeley.edu/targeted-universalism. Chuck Marr, Chye-Ching Huang, Arloc Sherman, and Brandon Debot, “EITC and Child Tax Credit Promote Work, Reduce Poverty, and Support Children’s Development, Research Finds,” Center on Budget and Policy Priorities, October 1, 2015, https://www.cbpp.org/research/federal-tax/eitc-and-child-tax-credit-promote-work-reduce-poverty-and-support-childrens.